The 20th Hussars was stationed at Colchester, Essex when Britain declared war on Germany on 4 August 1914. The Regiment was quickly mobilized and landed at Havre, France on 18 August as part of the 5th Cavalry Brigade. This Brigade became part of Gough’s Command on 6 September which became the 2nd Cavalry Division on 16 September 1914. The 20th Hussars then served on the Western Front with the 5th Cavalry Brigade, 2nd Cavalry Division for the duration of the war. The Regiment saw a good deal of action in 1914, from skirmishes with German cavalry shortly after landing to fighting dismounted during the First Battle of Ypres (19 October – 22 November 1914) where the 20th Hussars suffered heavy casualties. The 20th Hussars, like other British cavalry regiments, spent its time rotating in and out of the front line once trench warfare had become established. This caused the Regiment a continual stream of casualties throughout the war. The Regiment took part in the Battle of Cambrai (20 November – 6 December 1917) and suffered heavy casualties in the opening weeks of the German Spring Offensive which commenced on 21 March 1918. 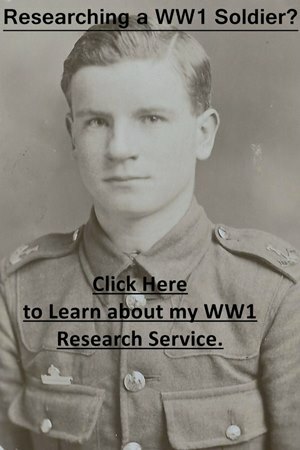 Start your research by looking for the relevant guides to researching soldiers who served in the British Army during the First World War. Initially, focus on service and medal record articles and keep open my page on British Army abbreviations and acronyms. The Regiment’s war diary for the First World War is good so I’d recommend downloading that. The Regimental history 20th Hussars in the Great War by Major J. C. Darling (see below) provides a good account of the Regiment’s activities during the war. Officers: There’s usually a lot of information on British cavalry officers and the most important document to try and find is their service records. The National Archives have some (I offer a copying service for these records) but if they served past April 1922 then their record will still be with the Ministry of Defence: Ordering a Service Record from the MOD. The war diary contains a lot of officers mentioned by name so have a look through. The regimental history is full of officers’ names but unfortunately doesn’t have an index. The London Gazette and Hart’s Army List will also provide you with information. If you are after a photograph, The Sphere, Tatler and Illustrated London News are good newspapers to search. See my page on Researching Soldiers Using Newspapers. Portrait of Lieutenant Harold Martin Soames 20th Hussars who was killed in action on 23 August 1914. 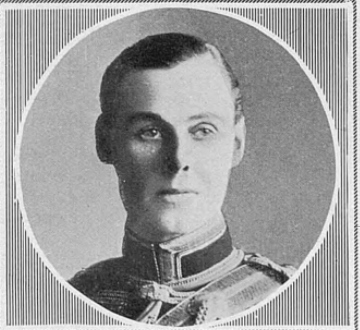 This portrait appeared in The Sphere which is an excellent resource to use when researching officers who died during the war. There is a service record for Soames at the National Archives: WO 339/6389. Other Ranks: A service record is the key document to find but many were destroyed in the Blitz. If a soldier served past January 1921 then his service record should still be with the Ministry of Defence: Ordering a Service Record from the MOD. If there is no service file, then, unfortunately, many facts about the soldier’s service will have been lost to history. However, often there are other documents to find including medal records. If you have a soldier’s regimental number then you can often work an approximate enlistment date. Newspapers are fantastic resources especially if you’re looking for casualties or a photograph of a soldier. The regimental history does contain the names of some other ranks, though most are senior non-commissioned officers. If you’re researching a soldier who served in the First World War you’ll need to check the records on FindmyPast and Ancestry. Both sites have free trials and if you live in Britain you can often access them for free at your local library. Clicking on the banner below will take you to FindmyPast. 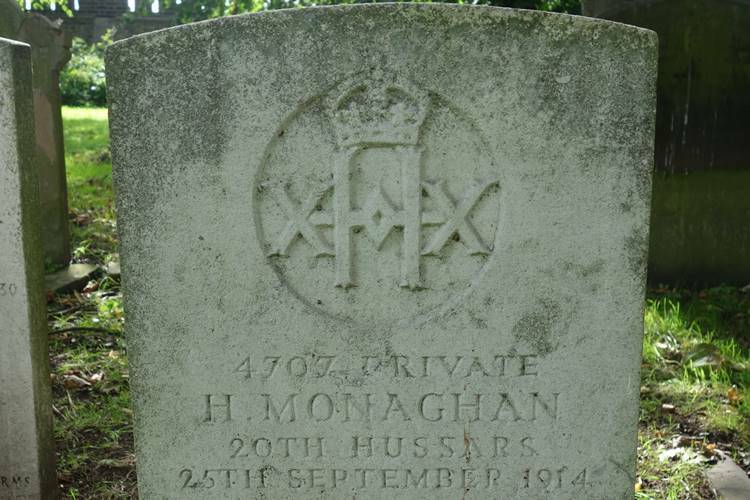 Below is the headstone of 4707 Private Hugh Monaghan 20th Hussars who died on 25 September 1914 and is buried in Brompton Cemetery, London. There is no service file available for Monaghan as it was destroyed in the Blitz. The admission register of the Queen Alexandra’s Military Hospital, Millbank recorded that Monaghan had a gastroenterostomy shortly before his death. Monaghan did not serve abroad and therefore did not qualify for any campaign medals. There are two war diaries for the 20th Hussars and the first covering the Regiment’s service on the Western Front has been digitized. To download this war diary for a small fee click on the first blue link below. The second war diary can only be viewed at the National Archives, though I have a copy. Notes: A good war diary which is nearly 500 pages in length and contains a wide variety of appendices. Notes: A good war diary for the period with detailed entries. There is a list of British officers who left Egypt with the Regiment on 29 June 1920. There is a regimental history: 20th Hussars in the Great War by Major J. C. Darling. A good and readable regimental history which should be used in conjunction with the 20th Hussars’ war diaries. Unfortunately, there is no appendix. This book was republished by the Naval and Military Press in 2006. A diary was kept daily from Aug 4th to Aug 20th, the mobilization and concentration period but was in Serjeant Fairbrother’s the orderly room serjeant’s saddle bag on Aug 28th when his horse was shot under him in action and it had to be abandoned. Aug 4th: 6.15 p.m: The Regiment received the order to mobilize. Aug 5th: 1st day of mobilization which was completed by Aug 9th. Aug 16th: The regiment left Colchester at 7.30 a.m in four trains to form part of the Expeditionary force. The following was the strength on leaving Colchester (including attached): 26 officers, 1 warrant officer, 37 staff sergeants and sergeants, 22 artificers, 6 trumpeters, 457 rank and file. Total 549 and 608 horses. H.Q. arrived Southampton at 7.30 p.m. and were sent to a Rest Camp as were B and C Squadrons. A Squadron arrived at 2.30 p.m. and commenced to embark immediately. Aug 17th: H.Q. and B and C squadrons embarked on SS Indore. Aug 18th: SS Indore sailed at 3.45 a.m. SS Indore arrived Havre 5 p.m. The regiment spent the night at the Railway Station in a shed. Aug 19th: Let Havre: 8.39 a.m. Arrived Rouen: 1.9 p.m. watered and fed. Departed 2.5 p.m. Arrived Amiens 9.p.m. Departed 9.10.p.m. Aug 20th: Arrived Hautmont (near Maubeuge) 3.30 a.m. disentrained and went to billets at Limont. Brigadier saw Commanding Officers at Chateau Colle? at 4 a.m. and issued verbal orders for march on 21st.